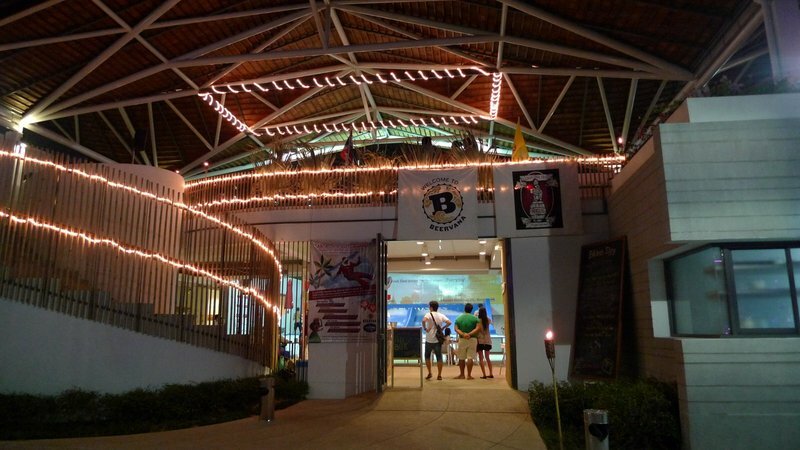 This entry was posted in Uncategorized and tagged Bangkok, Beer, Beervana, Christmas, Dining, food, Hawaiian, Luau by christao408. Bookmark the permalink. That’s quite an interesting meal, having Hawaiian cuisine in Bangkok. And watching indoor surfing as well! I think I’d have liked the dessert.. and maybe the pork – but I never eat the skin. Too much fat! Salmon and dessert for me. It is interesting pairing beer with the food. I am not a beer drinker but would have enjoyed sampling the different taste and how it added to the food. Oooo…. this looks like fun! I love beer and watching those hot guys surf. I would recommend they change the name of Rogue Yellow Snow IPA. 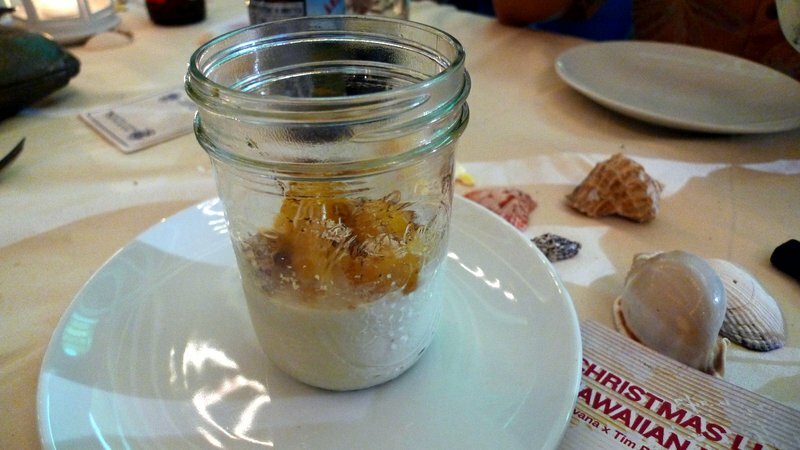 I was a bit skeptical about a luau in Bangkok, but that’s not too far from the usual fare—including the dessert. It would be a haupia pudding or custard. That Flow Rider looks like fun and I wonder if they would allow an old lady to sit on the surf board and surf down. I think I would give that a try.Meal looks good but not the beer. Totally disagrees with me. The pork looks wonderful.From my home to yours, a very Merry and Blessed Christmas. Prawn and Spam. The Odd Couple. Too bad it didn’t work for you. The pork looks good! I didn’t get to a luau when we in Hawaii, it just didn’t sound like something I wanted to do. Too bad about the custard. I guess eating out with friends isn’t always all about the food. Usually the Chinese add red dye to their roast pork. Was there dye added or that was just due to the photography?I wouldn’t know if the Prawns were undercooked or overcooked. Does overcooking them make them tougher? Looks festive and fun. Merry Christmas to you and yours, Thai style…. 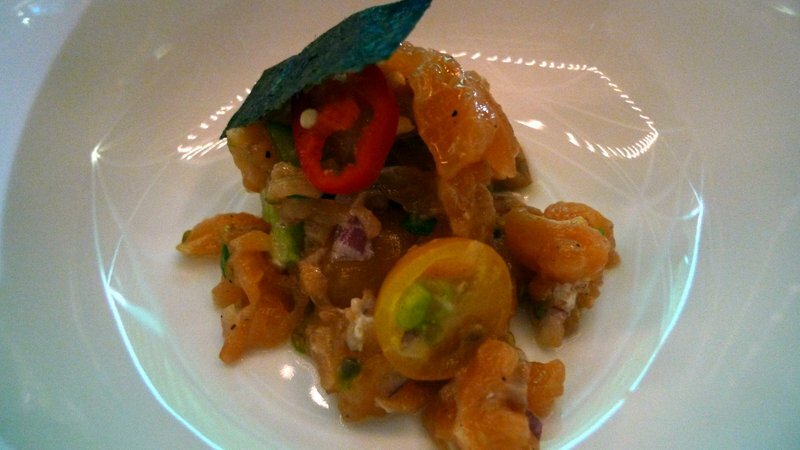 lomi salmon without poi?! and what about all the other dishes, like the squid luau or the chicken long-rice? the haupia (coconut dessert) looks good though.i wonder if the kalua pork had the right flavors… traditionally it’s cooked over coals to give it that smokey flavor and crispy skin, but the other thing is that you can’t put the pig directly on the coals or it will burn… chopped up banana stumps are laid down first, and then the meat is wrapped (or covered) in banana leaves. 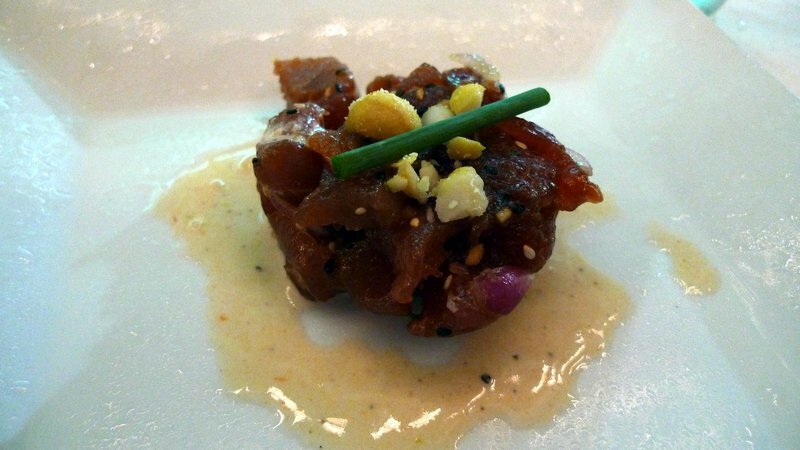 So you end up with this delicious sweet-savory addition to the meat that most kalua pork recipes fail to include. Merry Christmas!! That looks like such a fun place to have a meal. Any plans to try out that Flow Rider yourself?! @murisopsis – “If done right, hasn’t most of the fat melted away during the cooking?” he asked with innocent naïveté. @CurryPuffy – Sadly, the selection of surfers didn’t compare with a proper Hawaiian beach. @Fatcat723 – Agreed – I’m not a beer drinker, either, but the nuances of the different types of beers with the different ingredients were interesting to observe. @ElusiveWords – I’d imagine the name was chosen quite purposefully. 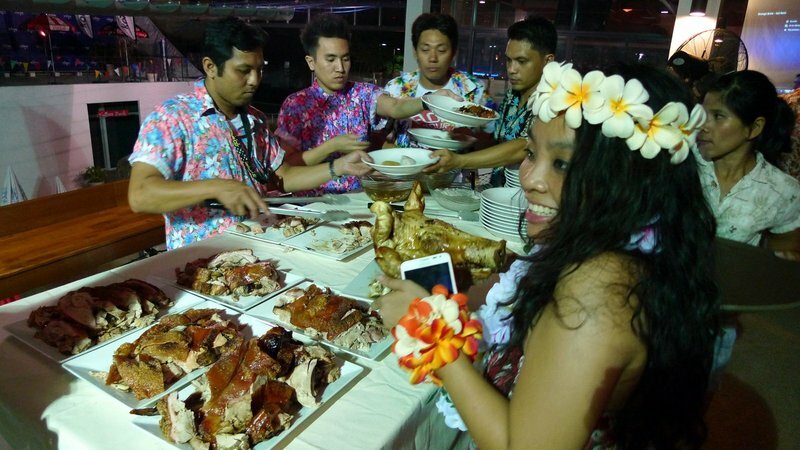 =P@n_e_i_l – @kunhuo42 – Of course, some corners were cut and some compromises made when it came to authenticity of the luau. For the most part, though, it wasn’t too far off from what I’ve enjoyed in the islands. @Grannys_Place – Thanks for the rec. Yes, I’m sure they would invite you to jump on. If I understand correctly, you start out by kneeling on a wider “boogie board” and then move to more upright positions. 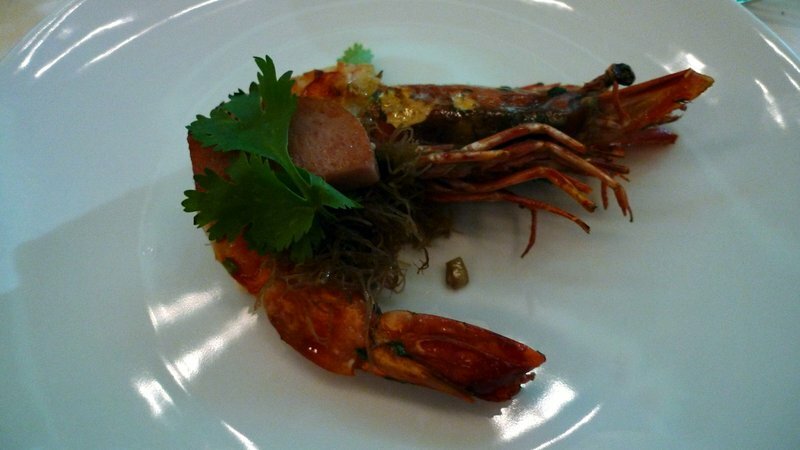 @Inciteful – Prawn, Spam, and seaweed – the odd trio! @whyzat – You know, I’ve gone to one proper luau in Hawaii and it was a great experience. The more touristy luau I attended was okay, but the one held at a friend’s family’s compound was fantastic. 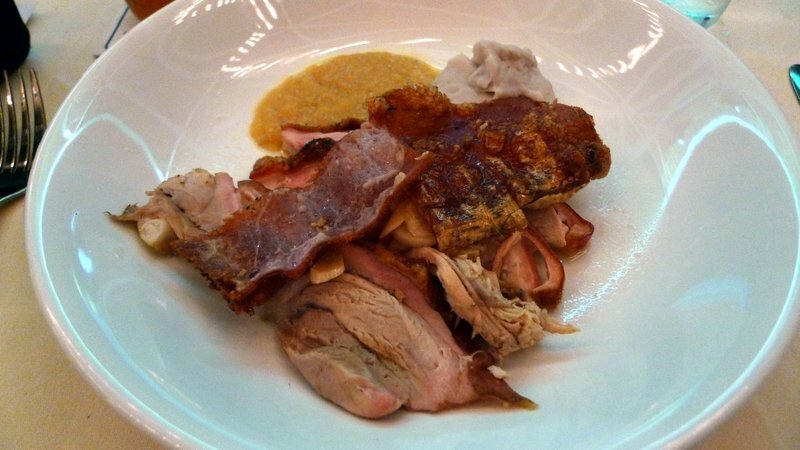 @PPhilip – I would be very surprised if this chef used any artificial coloring in his roast pig. As for the prawn, yes an overcooked prawn has tough meat and an undercooked prawn is a bit mushy. @armnatmom – Thanks, and a Thai-style Happy New Year to you! 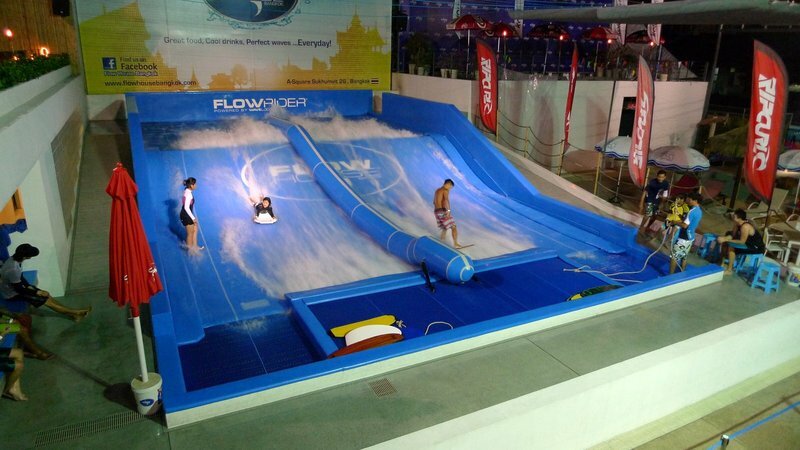 @mizz_chan – I received a coupon for a free one hour Flow Rider session. If I could find someone to go with, I would probably try it. Looks like fun.